After a long, thinking book last time, this book - satisfying the third category on the list (a YA bestseller) - was perfect to get my 'read' on and just enjoy. 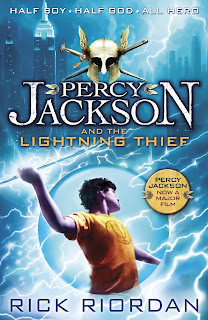 I read Percy Jackson and the Lightning Thief by Rick Riordan. It was wonderful, and I'm talking my daughter into reading the whole series when she's done with what she's reading. While I'm not sure if I'm the only one who wasn't already familiar with the premise of the Olympians series, they're about kids who are demi-gods. In this one, Percy Jackson has no idea that he's the son of a god, just that odd things seem to happen to him. The Kindly Ones (monsters, mostly) usually start sniffing out the demi-gods when they are around sixth-grade age. If the kids are lucky, someone shows up to help them get safely to Camp Half Blood, where they're generally safe. Not long after Percy's arrival at Camp Half Blood, they discover who his father is, and things start to get really interesting. He learns even more about the gods, and remembers the mythology he has learned from his under-cover teacher, on the quest he is chosen to take on with the help of two of his not-quite-human friends. I'd definitely recommend this book for young adults or adults. I hope to make other books fit into categories on the reading list so I can read more about the Olympians. So I've never actually read the Percy Jackson books, but the movies are great :). I have heard nothing but good about these books. I have one, but have not read any of it as of yet. Thanks for the review. I might have to bump it up on my to-read list. I've read all the books but only watched one of the movies. The books were. So. Much. Better. My daughter loves these books. I will have to ask her if she read this one. I've heard the movies are great, I need to add these to our reading list! My girls are 7, what age do you think would be fitting?